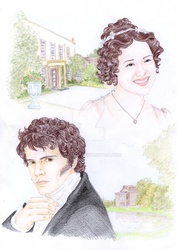 A group for those who love Jane Austen and her novels! And love making art! “Mom, have you thought about what you want to have for dinner when Bing and his sister come over?” Lizzie asks her mother. “I have it handled Lizzie. Now I believe you have class today try and meet a handsome young man while your there. Colleges have plenty of young eligible men around and it is a crime that you have not done so already.” Mrs. Benne dismisses her and Lizzie leaves the room. “Look I know you’ve put a lot of thought into this dinner and that you really want to make a good impression, but I think we need a different approach.” Lizzie informs her mother. “Lizzie…Oh you’re filming I’ll come back later.” Says Jane. “No you can come in if you want. I was just telling my viewers about the wedding. You can tell them about it if you want.” Lizzie offers. Lizzie introduces both Lydia and Jane in a more formal way to her viewers in separate videos. Lydia had the most fun with it by experimenting with camera angles and lighting to look her best. ‘Hopefully this prevents Lydia from feeling left out like last time. Once again ridiculous rumors surround Bing’s activities. She snorts at the thought of Bing brining in so many women to his place. “Lizzie!!! You won’t believe what I’ve heard.” Lydia says as she swings the door to Lizzie’s room open. The throbbing of her head is the first thing Lizzie notices when she is gaining consciousness. The second thing is that she is not in her room with her boyfriend. In fact the walls that stand in front of her are that of her parent’s home far from San Francisco. ‘This can’t be right. I couldn’t have gotten here this quickly….Is that my old laptop?’ Lizzie swings her legs over the side of her bed and takes a few quick steps over to her desk to take in what she finds there. Every thing looks as it did five years ago including a note that says “Shoot first video today”. “Lizzie! Charlotte’s here!” Jane says up the stairs. 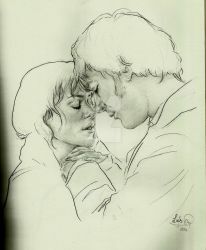 Pride and Prejudice is 200 years old! For 200 years it has been inspiring readers and writers and society in general. Jane Austen would be so proud to see the influence her novel has had on us all. Thanks so much for inviting me.. Thank you a lot for inviting me to the group. You're welcome! Please feel free to submit any artwork!